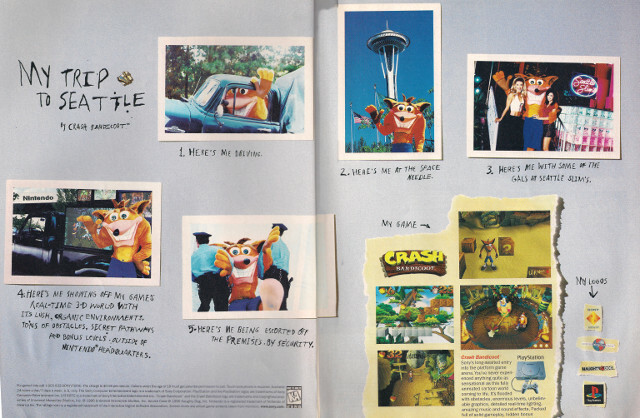 In the original PlayStation era, Crash Bandicoot was practically a mascot character for Sony’s new gaming machine. He was essentially to Sony what Mario was to Nintendo or Sonic the Hedgehog was to Sega (though this was sort of off-the-record; Sony and Crash never made official, and SCE’s exclusive rights to the franchise would eventually expire). If you wanted a zany mascot platformer and your console of choice was a PSOne, Crash was your man. He also starred in a series of really bizarre ads, most of which included some unremarkable-looking dude in a Crash Bandicoot costume. Sometimes he was hanging out with musclebound bodybuilders, and other times he was helping promote Pizza Hut to the lucrative gaming demographic. 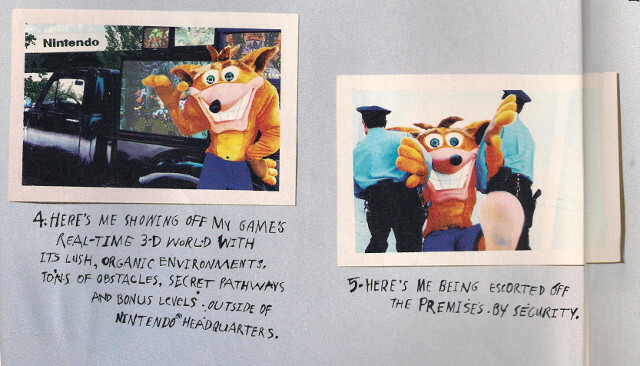 In the following two-page spread, he’s getting himself escorted from Nintendo of America’s Seattle headquarters. We found this ridiculous ad in the 97th issue of GamePro magazine (which is dated October of 1996). 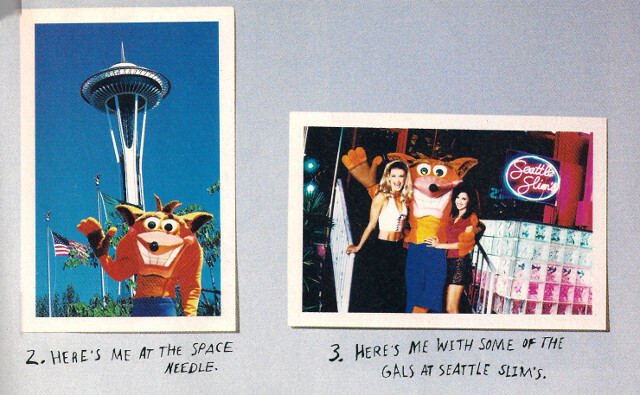 The premise is that Crash took a trip to Seattle to have some fun before attempting to promote his new game in front of Nintendo’s building in what’s likely an attempt at proving he had “edge.” It may not be as eye-catching as the later muscleman ad, but it shows a willingness to be weird that just screams 1990s. Never change, Crash. Never, ever change.